A couple of weeks ago, we shared with you a deal for Arlo's Pro 2 cameras, but it was only for the 6-pack of cams. If you don't have a large surface to cover and you're interested in getting a new security system (or adding to your existing one), today's deals might be right up your alley. First, the Arlo Pro 2 is the upgraded version of Arlo's wire-free security cameras with 1080p video recording, weather resistance, activity zones, 7 days of free cloud recording, and plenty of smart home integrations (Google Assistant, Alexa, SmartThings, IFTTT, and more). The cameras have rechargeable batteries and aren't directly connected to your Wi-Fi network: they require a hub, which Arlo calls a Base Station. 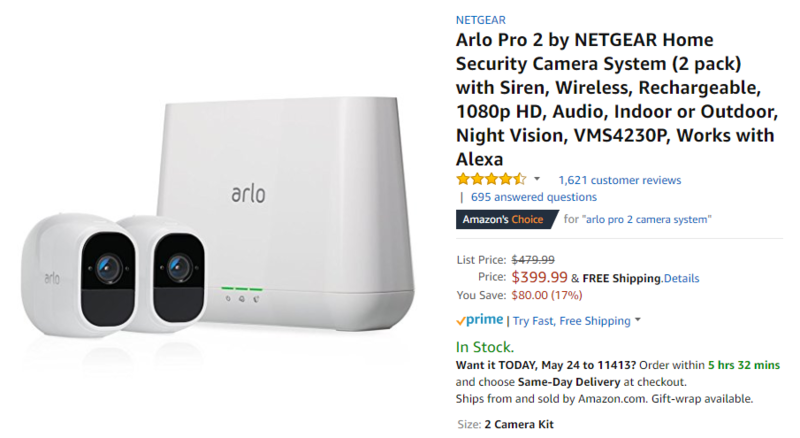 Personally, I'm really tempted but I keep going back and forth on the Arlo solution. My Canary cam is doing its job for the time being, but I don't like what the company has done lately. Arlo would integrate better with my SmartThings system and my Google Homes, and it would be more easily mountable outside the apartment instead of having the Canary inside. But I hate hubs, especially ones that require a direct Ethernet connection, and that's stopping me from jumping to Arlo.